Scientists from Oriflame’s Skin Research Institute, located in Sweden, outline their approach for identifying skin ageing targets and finding active natural ingredients that modulate them using Pathway Studio and Reaxys Medicinal Chemistry. Using a targeted, data-driven approach in the early discovery phase, their process yielded several active natural ingredients that were patentable—all within six months, half the usual time for such analytical work. Oriflame’s R&D team was charged with identifying and developing a safe, effective product to improve the appearance of age-associated fine lines and wrinkles. To accomplish this, they had to deal rapidly and cost-effectively with a tremendous amount of data from both biology and chemistry, which needed to be explored and honed to uncover appropriate targets and compounds. To solve the problem of skin wrinkling, the team followed a three-pronged roadmap that included constructing a skin-ageing molecular network by investigating critical components to understand the cellular interactions involved in their regulation; screening to identify a novel, patentable anti-ageing extract by constructing an activity-based extract network; and validating the safety and efficacy of the extract in a series of in vitro and ex vivo studies. Elsevier’s Pathway Studio was critical in helping to construct the network, while they turned to Reaxys to assist in screening. 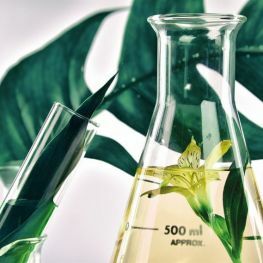 The process yielded a novel, patentable plant extract that acts safely and effectively on multiple skin-ageing targets. Using the appropriate tools at each stage enabled the team to reduce risk in the early stage, impacting assay screening and development, plant source selection and toxicity testing. The use of Elsevier’s tools also reduced development time and costs, and improved the success rate for treatment efficacy.